Need a crowd pleaser on the holidays? The Jurassic Joe Dinosaur show is interactive, educational, relevant, accessible and of course, great for mumosaurus and daddydactyl too. 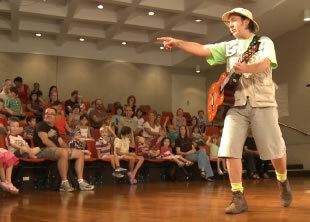 It’s a 45-minute, fun-filled musical ride through the amazing world of prehistoric reptiles that gets the whole family singing, dancing, laughing and learning. 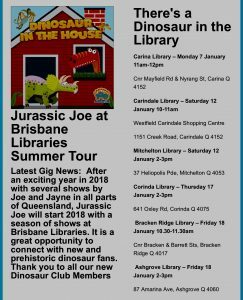 Over the past 1 million and 5 years, Jurassic Joe and Jurassic Jayne have presented the show at libraries, preschools, schools, museums, Australia Zoo, festivals from Sydney to England, Portugal and Germany, and in extended seasons at the Queensland Museum. This form is for public venues only (for a private party, click the ‘party’ tab, above). Gift bags and merchandise can be made available. Price will be negotiated depending on number of shows, crowd numbers and leagues travelled. We accept Mastodon Card and Dollars Australis.